Lobsters are one of Rhode Island’s top commercially valuable fisheries. In 2015, commercial lobster landings in the state were worth over $12 million, but the lobster industry has declined over the past several decades. The catch in 2015 was higher than in 2013 or 2014, but it was less than half of the $28 million value of the catch in 2000. This decline in lobster catch is related to an overall downward trend in the southern New England lobster population, partly due to young lobsters not surviving to adulthood. In addition to decreased survival rates, lobster populations are also negatively impacted by increases in lobster shell disease, which is caused by bacteria in the shell that can lead to increased mortality of lobsters directly from the disease but also from increased predation. Shell disease does not pose a threat to human health, but the unappetizing appearance of the shell makes these lobsters less marketable as whole crustaceans even though the lobster meat remains just as tasty and valuable. 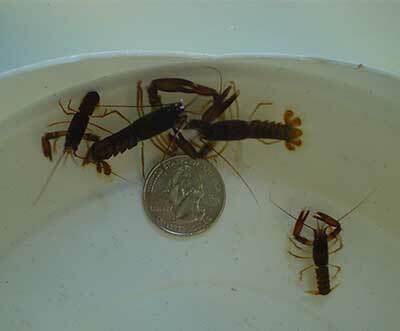 Juvenile lobsters counted through Rhode Island Department of Environmental Management monitoring efforts. Photo courtesy of RIDEM. The decline of lobster landings in southern New England impacts not only the livelihoods of Rhode Island’s lobstermen but also shoreside businesses such as fuel and bait companies; consequently, implementing carefully designed lobster fishery management decisions is a primary concern. The southern New England lobster population is managed by the Atlantic States Marine Fisheries Commission (ASMFC), which is a compact between the Atlantic coastal states and the National Oceanic and Atmospheric Administration (NOAA) Fisheries. In August 2016, the ASMFC announced a draft plan with options to adjust minimum and maximum lobster size limits, reduce trap numbers, and close seasons with a goal to increase egg production by 20-60%. If implemented, many of these strategic catch limits could significantly impact lobstermen, but population trends show that drastic action may be necessary to maintain the long-term viability of the lobster industry. Both trawl and ventless lobster trap survey data are vital to assess the health and status of lobster resources in Rhode Island, and will be highly informative when tracking the efficacy of these proposed management measures. In the 1990s, southern New England first experienced an outbreak of lobster shell disease. While there were previous instances of shell diseases in lobsters, 1990 marked a rapid increase in occurrence and is often referred to as epizootic disease, or a disease epidemic in a non-human population. Shell disease is caused by bacteria that eat away at a lobster’s shell and create lesions. Severe cases can lead to death or, in females, loss of eggs. While the condition is aesthetically displeasing, consumption of lobsters with shell disease does not pose a threat to human health; the bacteria that cause the disease are killed when the lobsters are cooked. Studies have found 30 percent of lobsters in Narragansett Bay have shell disease, but the exact impact on lobster population trends has not been quantified. 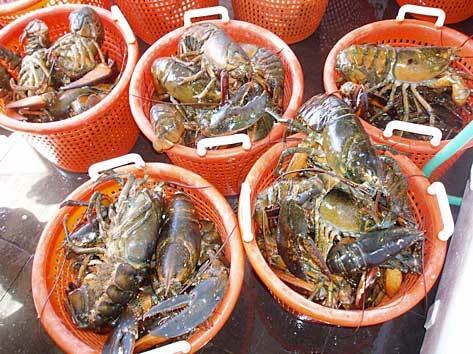 Shell disease is a major factor in the lobster population’s downward trend. Photo courtesy of Rhode Island Sea Grant. The cause of this shell disease outbreak is not definitively known. Epizootic shell disease is not easily transmitted from one lobster to another, and the disease is thought to be triggered by an environmental stressor. Researchers hypothesize that some outside influence causes the outbreak and prevalence of shell disease. One suggested cause is contaminants, but no specific causal link between a pollutant and shell disease has been found. Another possible cause is temperature. Researchers have found higher rates of shell disease in southern waters, correlating with increased water temperatures that could impact shell disease by creating a more favorable environment for the bacteria that cause the disease. 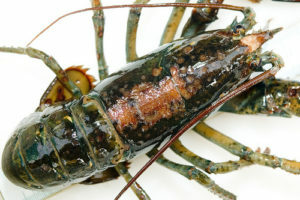 Shell disease coupled with warner waters can also play a significant role in lobster molting and maturity, which may be leading to non-typical physiological changes such as molting while carrying eggs. Temperature, shell disease, and predation are non-fishing influences on the lobster stock that may be playing a significant role in lobster population dynamics. Further monitoring will help to better explain the causes of this disease and lead to the more effective management of the lobster population.